Getting settled at the office! Hi Everybody! Thanks so much for reading my first post! The first two days went really well. Everyone in the office has been friendly and welcoming. On Monday, Jim came down to my office, yes I have my own office!, and we got to visit for a while. I can’t believe I’m working for him this summer; he is a really great guy and so accomplished! He encouraged me to get to know my neighbors on the floor. All of the employees have such interesting backgrounds; I am looking forward to getting to know them better. My official title this summer is the Executive Office Intern. There are four other interns with the Legal Services Corporation this summer, but we are scattered throughout the various departments. We had a brief orientation on Monday so that we could meet one another and learn more about the corporation. Today, the interns have a lunch scheduled with the Director of the Office of Legal Affairs. It sounds like we will get to have lunch with each department director by the end of the summer! I’ve already had a few assignments. Becky, one of the Special Assistants to the President, had me construct a memo that highlighted connections between LSC and a prominent fellowship program. After I finished the memo, Richard, the other Special Assistant to the President, had me edit a strategic proposal and then draft a policy statement. It’s been fun to have different assignments each day. To break up the work, Kathleen, the Executive Assistant to the President, took me out to lunch yesterday. She has been so kind and helpful since I got here and it was great being able to visit with her outside of the work setting. We went to her favorite place which was right up the street! I’m definitely feeling more confident about being in DC. The bus and metro systems have been pretty easy to figure out and the weather has been great for walking and sightseeing! I’m glad that I’m living at GW and working in Georgetown; it makes seeing both areas of the city much easier. Tonight, I have plans with Megan, a girl that lives in a dorm down the hall. We met on Sunday while we were both moving in. We’re going to this really cool restaurant down the street that is popular with the “college crowd”. It’s nice to already have some friends down here, especially since they all have internships this summer, so we can relate to one another! My goal is to include a picture in every post this summer. Below is a picture I took Monday of the view I have from the office. 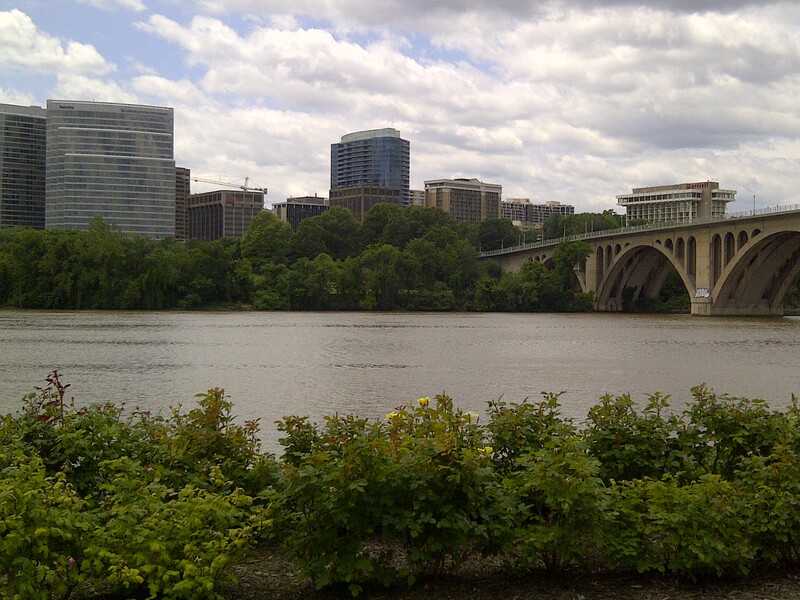 We are located right on the Potomac River and across the bridge is Virginia! ← The start of my summer in Washington, DC!